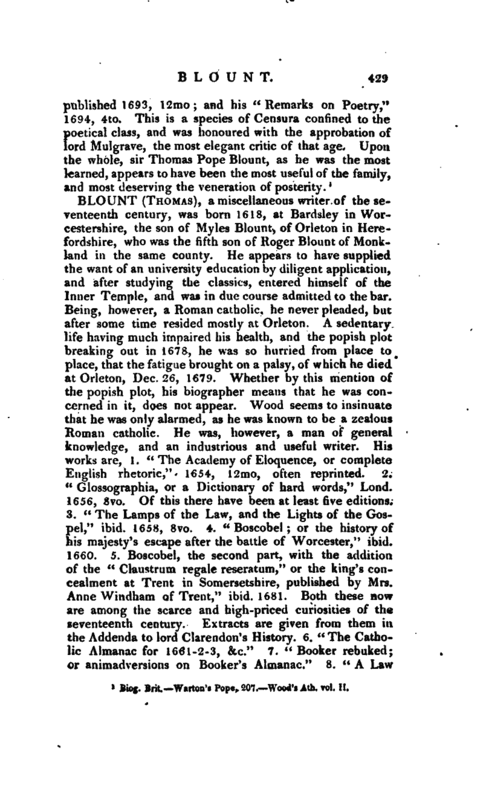 , an eminent writer towards the close of the seventeenth century, was the eldest “son of sir Henry Blount before mentioned, and was born at Upper Holloway in the county of Middlesex, Sept. 12, 1649. 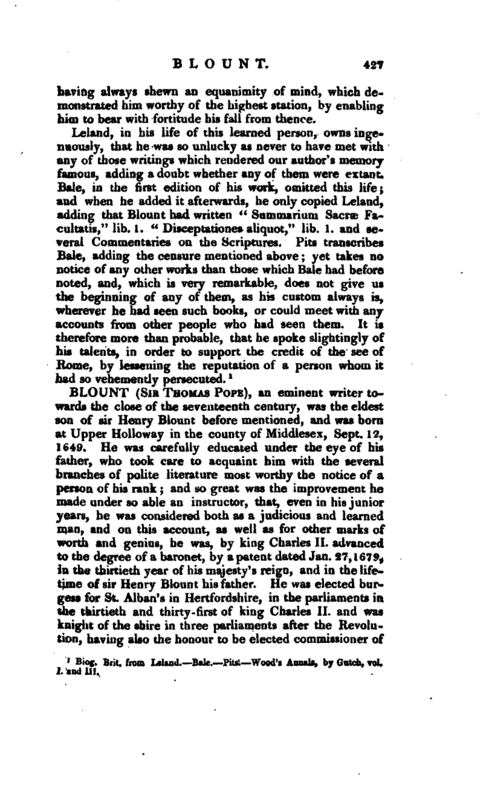 He was carefully educated under the eye of his father, who took care to acquaint him with the several branches of polite literature most worthy the notice of a person of his rank; and so great was the improvement he made under so able an instructor, that, even in his junior years, he was considered both as a judicious and learned man, and on this account, as well as for other marks of worth and genius, he was, by king Charles II. advanced to the degree of a baronet, by apatent dated Jan. 27,1679, in the thirtieth year of his majesty’s reign, and in the lifetime of sir Henry Blount his father. He was elected burgess for St. Albari’s in Hertfordshire, in the parliaments in the thirtieth and thirty-first of king Charles II. and was knight of the shire in three parliaments after the Revolution, having also the honour to be elected commissioner of | accounts for the three last years of his life by the house of commons. He always distinguished himself as a lover of liberty, a sincere friend to his country, and a true patron of learning. 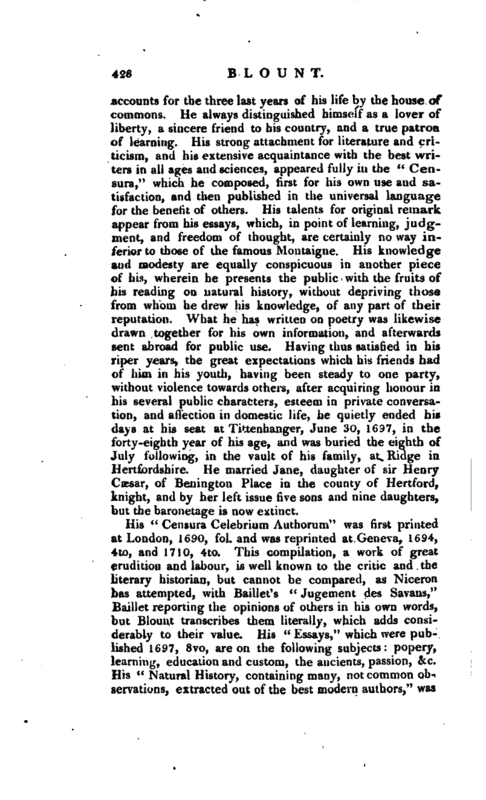 His strong attachment for literature and criticism, and his extensive acquaintance with the best writers in all ages and sciences, appearecLfully in the” Censura," which he composed, first for his own use and satisfaction, and then published in the universal language for the benefit of others. His talents for original remark appear from his essays, which, in point of learning, judgment, and freedom of thought, are certainly no way inferior to those of the famous Montaigne. His knowledge and modesty are equally conspicuous in another piece of his, wherein he presents the public with the fruits of his reading on natural history, without depriving those from whom he drew his knowledge, of any part of their reputation. What he has written on poetry was likewise drawn together for his own information, and afterwards sent abroad for public use. Having thus satisfied in his riper years, the great expectations which his friends had of him in his youth, having been steady to one party, without violence towards others, after acquiring honour in his several public characters, esteem in private conversation, and affection in domestic life, he quietly ended his days at his seat at Tktenhanger, June 30, 1697, in the forty-eighth year of his age, and was buried the eighth of July following, in the vault of his family, at Ridge in Hertfordshire. He married Jane, daughter of sir Henry Caesar, of Benington Place in the county of Hertford, knight, and by her left issue five sons and nine daughters, but the baronetage is now extinct. 1 Biog. Brit. Warton’s Pope, 207. Wood’s Ath. vol. II.